7905 E. Prairie Meadow Drive in Denver, CO 80238 is for sale for $839,500 and is located in the Stapleton neighborhood of Denver. New price improvement!! 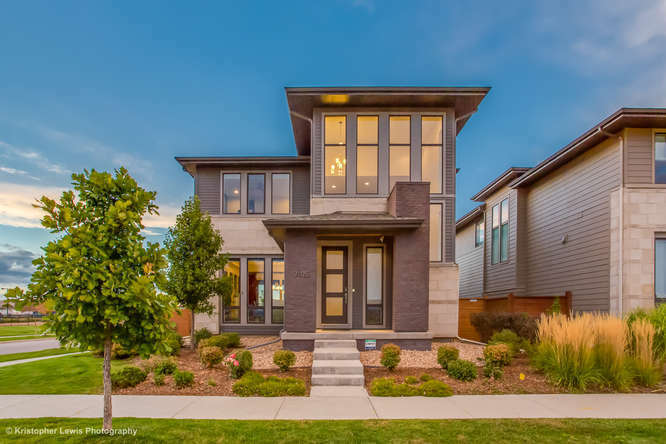 Poised in one of Denver’s most desirable neighborhoods you’ll find a contemporary and sophisticated award-winning home that is in like-new condition. Its excellent location sits on a corner lot directly across from Prairie Basin Park and offers ample space and privacy from your neighbors while also offering the beauty of being on so much open space. Enjoy stunning Colorado sunsets and mountain views right from your very own living room. The exterior will dazzle you with its modern architecture while the interior is bathed in natural light and its numerous floor to ceiling windows that invite the outdoors in. The floor plan is a contemporary masterpiece with its wide-open kitchen, living room and dining room spaces that flow effortlessly to the large covered outdoor patio. The level of finish is upscale with custom cabinets and designer tile selections throughout. The Master Retreat is spacious with its stylish 5-piece bath with an elegant Maxx soaking tub, dual sinks and large walk-in closet. The upstairs living space also includes 2 additional spacious bedrooms, a loft that could be converted to a 4th bedroom, a full bathroom with dual sinks and a convenient laundry room with sink. The home also features an owned solar panel system that creates 30%-40% more electricity than is consumed which keeps your average utility bill extremely low. For a list of all Stapleton properties for sale click HERE! PLEASE READ! 7905Eprairiemeadow.Com REQUIRES CONSIDERATION FOR AND AS A CONDITION OF ALLOWING YOU ACCESS. ALL PERSONS UNDER THE AGE OF 18 ARE DENIED ACCESS TO 7905Eprairiemeadow.Com. IF YOU ARE UNDER 18 YEARS OF AGE, IT IS UNLAWFUL FOR YOU TO VISIT, READ, OR INTERACT WITH 7905Eprairiemeadow.Com OR ITS CONTENTS IN ANY MANNER. 7905Eprairiemeadow.Com SPECIFICALLY DENIES ACCESS TO ANY INDIVIDUAL THAT IS COVERED BY THE CHILD ONLINE PRIVACY ACT (COPA) OF 1998. 7905Eprairiemeadow.Com contains links to other web sites. Please note that when you click on one of these links, you are moving to another web site. We encourage you to read the privacy statements of these linked sites as their privacy policies may differ from ours. Do you have a good faith belief that your intellectual property rights have been violated by The Neir Team? Do you have a good faith belief that a third party may have uploaded content to 7905Eprairiemeadow.Com? 1. Please describe the copyrighted material, work or other intellectual property (collectively "Material") which you believe is being infringed upon, and where on the 7905Eprairiemeadow.Com website the Material is located.